The Polynesian Resort will revert back to the original name of “Disney’s Polynesian Village Resort”, and will get Trader Sam’s bar. DVC bungalows completed some time in 2015. Downtown Disney will become Disney Springs with the opening of the first section, The Landing, in early 2015. Other sections (Westside, Town Center, Marketplace) will be in 2016. 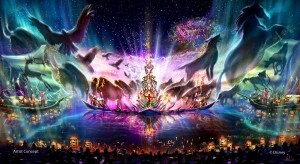 Harambe Nights separate ticket event at Animal Kingdom will include special Lion King performances (which moves into the new theater in June), narrators every Saturday from June 7th-August 9th from 7:30-10:00pm. Tickets will be $119 adult, $79 child. Mickey’s Jammin’ Jungle Parade at Disney’s Animal Kingdom park will be ending sometime in June, according to a Disney spokesperson. The parade route takes it past the area that is now being developed into the Avatar-themed land, and would be impeded by the construction. The parade will have been almost 13 years old when it closes. A replacement was not mentioned or immediately planned, but other entertainment including a nighttime light show had been previously announced. Affected parade workers will be reassigned. While details of what is exactly going to be in it, Walt Disney World finally broke ground at its Animal Kingdom park to add the new land based on James Cameron’s Avatar – more than two years after it was announced. 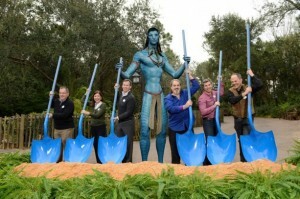 And not only was Mickey Mouse present, but a Na’vi as well – as well as (pictured, l to r) George Kalogridis, president of Walt Disney World Resort; Meg Crofton, president of Walt Disney Parks and Resorts Operations, United States and France; Tom Staggs, chairman of Walt Disney Parks and Resorts; Jon Landau, producer of Avatar; Bruce Vaughn, chief creative executive for Walt Disney Imagineering; and Joe Rhode, creative executive for Walt Disney Imagineering. Check out the video as well for what they said about Avatar.